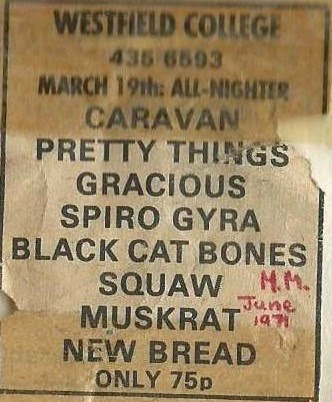 In 1971 Chris formed the band Squaw with Mark Hankins and Lindsay Bastedo, rehearsing at Mark's flat (appropriately located above an off license) in Kilburn, London. London, and at Westfield College where Mark was studying, notably one particular all-nighter gig alongside Caravan and The Pretty Things. Chris and Mark then formed the band Palomino, with Brian (Wally) Wallis on bass, Henry Morris on vocals and harmonica, and Blue Creswell on percussion. Playing the pub rock scene and university gigs supporting such acts as America, Osibisa and Vinegar Joe (with Elkie Brooks and Robert Palmer) at the Hampstead Country Club, and Gypsy at same venue. Palomino were regulars at Westfield College(London) often playing Rag Balls and supporting names such as The Pretty Things, Caravan, Spyro Gyra, Gracious and The Faces. The band also supported Neil Sedaka at the Albert Hall on 29th September 1972. Palomino provided a first airing of Chris Bradford's early songs. Henrys '60 Chevy Apache . . the Palomino band wagon . .
. . groovier than a transit ! October 1972 Palomino did the backing vocals for Noel Edmonds' (aka Shaking Kirk Houston) single "Alcatraz / Who Took The Colours". Everyone has to pay the bills somehow, even Noel. Palomino recorded one album, affectionately titled "Loony Module" in June 1972 at Kaleidophon Studios, and Escape Studios with producer/engineer David Vorhaus and producer Micky O'Keefe. The album, a rich set of melodic rock/country-rock songs, remains unreleased. All songs written by Chris Bradford, except *1 written by Mark Hankins. Publisher: Very Good Music Company. Kaleidophon Studios, Camden High Street. Producer: David Vorhaus. Palomino: where are they now? Bluey Cresswell (drums) - Palomino, Parcel of Rogues, Elderly Brothers, Grumpy Old Men. . .
Brian Wallis ( bass guitar /vocals) - Palomino, Randy, Nantucket (with Mark Hankins), The Heroes. Currently playing with his new band - The Goodfellows in North Devon. Henry B Morris (guitar/vocals /harmony king ) - Squaw, Palomino, The Refrains. Pip Williams assistant for several years through the Moody's /Bardot period. After fighting Cancer he's in the early stages of forming a new harmony band from his eyrie looking out to the Isle of Wight. . .
Mark Hankins ( lead guitar/vocals) - Squaw, Palomino, Randy. After Randy, Mark spent a couple of years in the west country country-rock band 'Nantucket' (with Brian Wallis playing bass) and then with the (jazz/blues) John Morgan Band who recorded for Pye. He then joined The Heroes and then The Bloody Rajahs after which he played with an Australian band: The Mixtures, who in 1970 had been at no 1 with the singalong "Pushbike Song" which is (gladly) now a distant memory. Mark followed up by playing with the New Seekers for 16 years and is now living happily about as far West as you can get in The UK ! By the way, Randy recorded the Chris Bradford song "Crazy Love" on their 1974 Transatlantic debut album Lady Luck, (TRA290) produced by Ritchie Gold.